SJ: Thanks for taking the time to talk with us. Who or what inspired you to start playing in the first place? EG: I always had a musical ear as a kid. When I was about ten years old I saw Segovia on television. That was the first time I’d ever heard the guitar played as a solo instrument and it floored me. It wasn’t until four years later I convinced my Dad to get me a guitar. I started with an interest toward classical music but I couldn’t find any good classical guitar instructors near me so I did what everyone does, went down to the local music store and sat with a nerdy guy and played those horrible things, the songs you never hear outside of the backroom of a music store (laughs). I took about three lessons there. Quit those lessons, got a couple of books. I never did learn too much from those books, just a few chords. A college kid had moved across the street from me in Pennsylvania where I grew up. He was a guitar player, so whenever he was home from college I’d take a lesson or two with him. So I made it a point to digest as much as I could in one sitting. I would learn pretty much an entire tune in one lesson. Not all the details, but I could get from the beginning to the end and figure out the rest by myself later on. SJ: Sounds like you are largely self-taught then? EG: Pretty much. This college friend of mine was a guy named Bill Morrissey, if that rings a bell with anyone. I would take a few lessons from him when he was home, but in the meantime I had to figure out some way to learn tunes so I applied myself. I always had a pretty good ear so that always served me well. It allowed me to not only figure out what was going on in a piece of music, but to memorize it. That’s one of the big things that I see now in a lot of players that are learning how to play – they don’t memorize stuff. It only exists on a page for them. They don’t have it in their head. But that was a natural thing for me. I ate it all up. SJ: I see that you offer occasional workshops and I’m curious if you have any general thoughts about the learning process? It seems to me when you watch a great musician play you see the results, but you don’t see all that went into producing those results, which might be years or decades of dedication and practice, overcoming obstacles, paying your dues, etc. What are your thoughts about teaching yourself to play? EG: I think that some people are more philosophically or motivationally inclined toward one way of learning as opposed to another. For me it was a natural thing to never say die or take no for an answer. I just kept working until I figured it out. But that takes a lot of time. People don’t seem to have a lot of time or be willing to make a lot of time, so they will often use aids like tablature or instructional videos which are great way to learn, but in order to really play the music has got to be inside you. You’re not trying to claw your way in from the outside. So my workshops are a little different than what folks might expect. I’m not sitting in a room telling everyone to play the same thing. What I like to do is to work with each player, listen to what they are already playing and use that as a starting point. What I try to do is to help them listen more deeply to the effects that they are having on the instrument. People will often ask me how to learn to play with more emotion or more dynamics. Unless you can really hear how your own technique is creating those effects on the guitar you’re going to miss those things. So you have to think, feel and do. That’s what I try to help folks do in my workshops. SJ: When I listen to your music I find myself taken with the beauty of your arrangements. You play with great finesse and communicate with your audience at a deep level, all without words. What is your perspective on instrumental vs. vocal music and how does that influence how you arrange your repertoire for live shows? EG: I never think about it in terms of instrumental vs vocal music. When I’m arranging something I am aware of what the song is about and I try to become intensely familiar with that – on my terms – not necessarily what the author intended and try to figure out what that means for me. For example I have an arrangement of Strawberry Fields Forever that I’ve been playing lately and it’s not one of those arrangements where I’m trying to duplicate everything that was done on the original recording. Sometimes those types of arrangements have almost a novelty effect. What I try to do is figure out what the song is actually about. Now this is not a tune that I play on Weissenborn, but the tune is not just a psychedelic romp with strange noises, that’s what the record is, but what the song is is not always represented on the recording in a way that everyone can understand. When you look at the lyrics – “no one I think is in my tree” – what does Lennon mean by that? If you know about John Lennon, you know that he was abandoned by his Dad, his Dad left his family. When he was four years old he went to live with his grandmother and his aunt. He saw his mother regularly but he didn’t live with her. He always thought he was a little genius and he felt that he saw and thought and felt things in ways that everyone else seemed to miss and that confused him. But he would go to this park and play and climb trees – he loved to climb trees. There was an orphanage nearby and the orphan kids would come out to play and they would come out to the park and he would play with them and he felt that he fit in with them. That’s what the song is about. So when I play that song that’s what I’m trying to get across, not the backward drums and noises. I mean I love that stuff, but I’m trying to take something and figure out what’s personal to me about it. That’s where that connection comes from. A lot of times people will hear things in a way they haven’t heard before. Other times they’ll hear something that should be intensely familiar and they’ll ask what is name of that (laughs)! SJ: So it’s a search for trying to understand and play out of your own experience vs. duplicating what someone else is doing? EG: Well, we all start out imitating and trying to make the sounds that we hear that we think are so cool. And that’s a really empowering thing. For some it leads to discovering our own selves as musicians. Other players just want to be amused and just duplicate music and that’s fine. I think that’s where most people are. But you hear people in the world who are taking their influences, internalizing them and what comes out sounds like a whole new thing and that’s kind of the hope for most of us – to be ourselves. Your interests lead you in a certain direction and you follow it. SJ: Did you start on guitar? SJ: What was the transition like moving from guitar to Weissenborn? What inspired you to start playing Weissenborn in the first place? EG: I always played bottleneck style slide. I’d mess around playing lap slide every now and then. I’d see a Weissenborn here and there and I’d played them, but the bug never bit me until sometime in the 90’s when I was recording a record called Counting the Ways. I wanted some Hawaiian guitar on the record, I loved the sound. I wound up getting a little electric lap steel to experiment with. I thought to myself this is a new thing. It’s still a guitar but totally different. So I recorded a tune with Bob Brozman playing on it. He played some Weissenborn on it. I was recording inSanta Cruz, California and Martin Simpson was out there at the time so I had him play on a track and Bob Brozman play on a track. Martin was opening a show for David Lindley at the Great American Music Hall and he invited me to come to the show. So I met Lindley and hung out. At that time he was traveling with his vintage Weissenborns and they just sounded magnificent and I said to myself “it’s time.” To hear the Weissenborn is one thing. It’s a beautiful compelling sound. But when you sit down and make that sound yourself, I mean, once you’re hooked, you’re hooked for life. SJ: That’s so great! I think it’s difficult for someone to completely appreciate the difference between listening to someone else play a Weissenborn guitar and getting those sounds out of the instrument yourself. It’s one thing to play a Weissenborn acoustically, they sound great, but you put a good pickup in one and play in a great sounding room in front of an appreciative audience the amount of sound and the depth of the sound is nothing short of amazing! EG: Yeah, generally I don’t like magnetic pickups in six string guitars, but in a Weissenborn it’s like they’re made for each other. You’ve got the acoustic Weissenborn guitar on one side, the electric lap steel on the other side and squarely in the middle sits the plugged in Weissenborn and it’s totally its own thing. One of the great experiences I had was playing a trade show in Germany. It was in this big industrial park in an arena sized room with an arena sized P.A. system with really great sound. I plugged in the Weissenborn in this gigantic rock and roll system and whenever I would play it was like sitting on a volcano. There was really high volume with enormous clear bass and you could see in the very back of the room there was a little hallway where people were passing from one hall to another. Whenever I would play the Weissenborn everyone would stop to listen. SJ: So when you are doing a live show you play regular guitar and Weissenborn guitar. I’m curious to know what kind of response you get from the Weissenborn. What kind of comments do you get? Do they even know what the instrument is? EG: Every now and then I’ll explain what it is but people are generally either informed or disinterested. Occasionally someone will approach me after a show a say what’s that laptop guitar you were playing? It sounds quite of twangy! But people seem to really like the sound of the Weissenborn. In some ways the Weissenborn has made my life miserable. The Weissenborn is so lush and full sounding and then I’d go to pick up the six string again, and plug it in and it sounded like two armadillos getting it on in a dumpster (laughs)! It’s made me work a lot harder on my six string rig and getting the best sound I can get out of it. So now I feel that I can go back and forth without completely losing that roundness and depth. SJ: How did you develop the repertoire of tunes you play on the Weissenborn? EG: The only tune that I play that I’ve heard other people play is “How Can a Poor Man Stand Such Times and Live.” I remember hearing that on an old Ry Cooder record and really liked the melody so I worked up a version in just about every tuning I was using – open G, open D, dropped D. I worked up different versions of the tune just because I liked playing it. So when I got the Weissenborn I decided to work it up and then found out that David Lindley had already beat me to it. But he’s accompanying himself singing where my version is a solo version with chords, melody and bass. As far as how I get ideas, I don’t know. Usually something just bubbles up. I don’t noodle around on the Weissenborn as much as I should. A lot of times you discover things – a lick, a chord progression or a rhythm which can lead to writing new tunes. EG: Open D is the one I use all the time. I tune it down a whole step so it’s actually open C. I used to tune down to B but sometimes P.A. systems can’t handle that low note, you know. SJ: Do you play without picks? EG: I use a thumbpick. Sometimes you want that extra bite on a downstroke. SJ: How do go about getting the best sound out your Weissenborn for live performances? What kind of pickup, preamps do you use? Do you use any spatial effects? EG: I use a Fishman Neo-D Humbucker, it’s a passive magnetic pickup which I run either through a Fishman Pro Platinum EQ D.I. which I’ve had for a million years or sometimes I’ll use an Aguilar Tube Direct Box which are no longer made, but mainly its right here (points to his hands), that’s where I get the sound. You have to hear what the instrument is capable of, learn what it’s capable of to connect what you’re feeling or thinking with the actual sound that’s being made. Only then can you really modify that sound and find an emotionally complete way to play; that all becomes part of your sound. SJ: I’ve found that playing squareneck dobro vs Weissenborn guitar requires a different approach. It’s not just a matter of D vs G tuning (DADF#AD vs GBDGBD) but the differences in string tensions and the way that the guitars respond to your touch. Getting good tone out a Weissenborn guitar seems to be more about finesse than anything else. 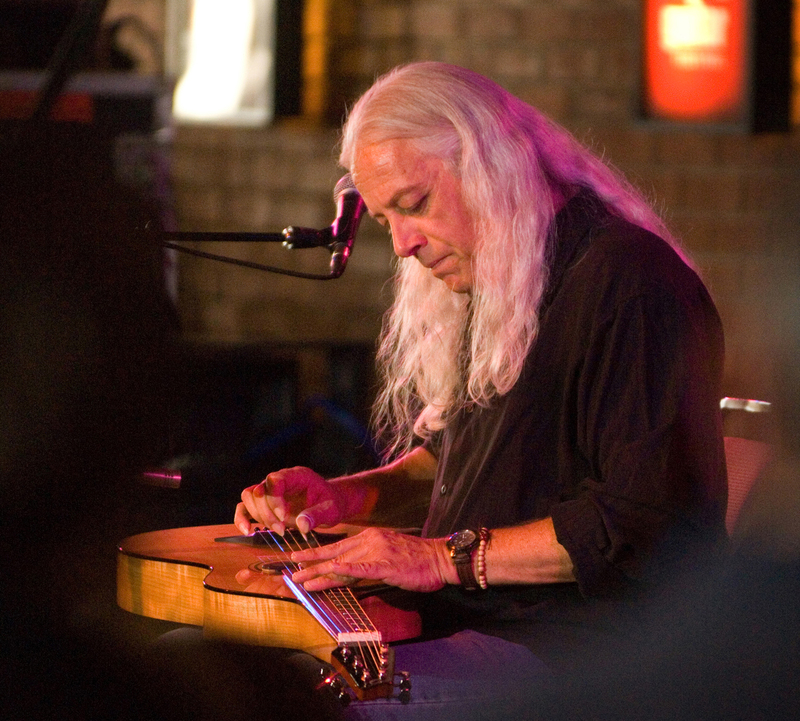 SJ: I took a lesson with dobro player Randy Kohrs one time and he told me that 80% of tone is in the right hand. EG: I believe that. Obviously you want an instrument to be capable of it, but if the sound system is bad, or your guitar is not sounding good you work harder to produce what you want and that’s what the right hand is for. But the right hand is only in service of what’s in here (points to his heart), you know what I mean? The hand is not going to do it by itself! SJ: That’s such a great insight. I love that! Can you give us an overview of your different Weissenborn guitars? EG: I’ve got a pretty good stash of different Weissenborns. I’ve got 3 of the original style 1’s. The best one is a monster, as light as a feather, you’ve played a bunch of Weissenborn’s so you know what I’m talking about. I have a style 2 that’s really nice, then I have some modern reproductions of Weissenborns. 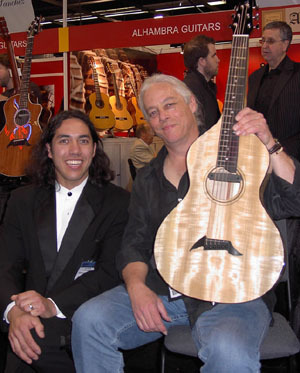 Jayson Bowerman, when he was working at Breedlove made me a really great guitar which I like which is made out of myrtlewood. I also have a Weissenborn made by Bill Hardin at Bear Creek which is an amazing guitar. It’s a strange combination of woods for a Weissenborn, its German spruce and Honduran rosewood. It’s a fairly heavy guitar. It’s a style 4. 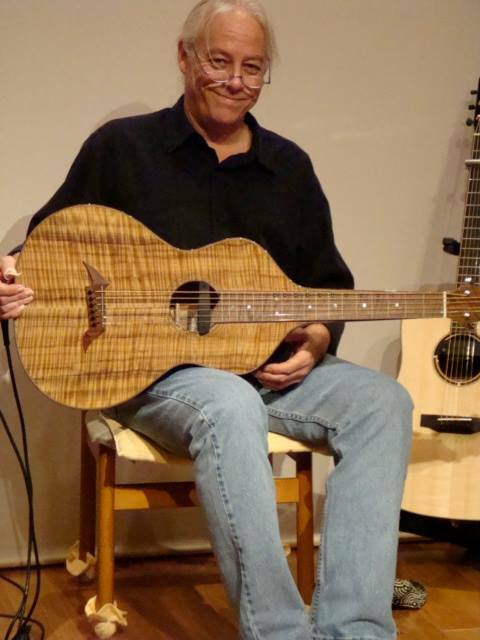 Bill Hardin makes a hell of a nice Weissenborn guitar. And it’s a monster. It’s got this low end on it that – you almost think that the strings are very dull and the notes are going to die away but they hang in there with all this presence. The treble is really fat on that guitar. Bear Creek is a really fantastic guitar. Jayson Bowerman, when he was working at Breedlove developed this Weissenborn with me which was based on my vintage style 2. Now he’s on his own building guitars. I haven’t played any of his Weissenborns but I’m sure they’re really good. Jayson has the magic touch. SJ: What’s with the frets below the 6th string on the Breedlove Weissenborn? EG: I’ll do stuff like play at the 7th fret and use my little finger to press down the string at the 4th fret, for example. SJ: So you’re pressing down behind the bar? EG: Yes. So you can get a bit more of a moving bass line. I discovered this when I got a really bad reproduction of a Weissenborn guitar from a guy in California. It was badly warped and set up way too low at the nut. So one day I was messing around, trying to see if I could get any notes out of that guitar and I made that discovery. So when Breedlove asked me to design a Weissenborn guitar with them I decided that I wanted that to be a feature of that guitar. It drove Jayson completely nuts. I think he hated me for a long time. It was really difficult to do that. At one point we had a slanted saddle and we angled the frets. The way its done now – and we have this patented – each fret is inlaid in a small piece of ebony and glued on to the fret board. So as the guitar changes, if the intonation starts going bad you can pop of the fret and relocate it. It’s a pretty cool system. SJ: When you play live do you use any kind of spatial effects? EG: I’ll try to figure out what kind of reverb the sound person has. I often travel with my own reverb which is a Lexicon LXP-1. I don’t know what I’m going to do when that thing dies, it’s just a great sounding ‘verb. Once in awhile if I’m using my own sound system I’ll bring the LXP-1 or a Lexicon PCM 90 which I will pull out of my studio. SJ: I used to own one and remember it well. EG: They’re great sounding reverbs. SJ: What has being a musician and playing professionally taught you about connecting with an audience through instrumental music? There are very few musicians who play at your level but there are a lot of us who love instrumental music that the Weissenborn is capable of and aspire to connect with our audience – no matter how small – through instrumental music. EG: It took me years and years to get completely comfortable playing in front of an audience. I always loved playing guitar in front of an audience, but it took a long time to get to that place where there was a sense of community. What I came to realize is that it’s already there before you even arrive, and an audience is never more curious, never more into what you are doing, than the moment you walk out on stage. Before you ever play a note that’s when the audience is most vulnerable and all you can do is screw it up from that point on. But I try to recognize that. My thought is that when the audience is at their most vulnerable, most curious, give them something right up front: give them the impression you want them to leave with. If you want to play something that shows that you are a good player with excellent tone than play something that demonstrates that. That connection is pretty much already there so I’m never uncomfortable on stage or I should say I never get nervous. Sometimes there are external situations – sound or lights – that are beyond my control which can impact a live performance. One of the things about playing Weissenborn is that you need to be able to see the guitar to play it. Making that connection, it’s a hard thing to describe without sounding like Deepak Chopra. It’s a very evasive thing. A lot of times you may be thinking you are making a really strong connection with a tune and you get a lukewarm reception. Sometimes that lukewarm reception can be misread as well. Sometimes you think it’s lukewarm and actually the audience is so blown away they can’t even clap. SJ: As a fellow musician I love vocal music and have hundreds of CD’s by my favorite vocal artists. At the same time my favorite musicians tend to be instrumentalists. I’m still trying to get my head around how and why instrumental music can be so powerful, so evocative without the listener not necessarily understanding what the music is about. It’s something that I feel at a much deeper level than I can articulate through the written or spoken word. EG: Absolutely! When I’m playing a tune, like I referenced earlier, Strawberry Fields, all that stuff I was talking about – there’s a lot of information that goes into this arrangement. A lot of choices and a lot of work go into presenting things in the light of how I think and feel about them. An audience is not going to get all that information, but they will get a sense that it’s there. You can tell when you hear two different people playing the same tune; you can tell who has the information and who doesn’t have the information. There’s a sense of ownership and authority. That’s one of the things that an audience will understand and notice. Are you confident or are you wasting their time; you know what I mean? You do hear a lot of that stuff. Sometimes it’s fun to hear; sometimes the stuff that tries so hard to get your attention winds up driving you away. It’s nice to be drawn into music sometimes. So I try to leave room for that. Everybody’s got their own way of connecting with an audience, instrumental or otherwise. I don’t ever think “there’s no vocals here so I’ve got to do something to get their attention.” It’s not always necessary to pander to your audience – it’s not always necessary to give them something snappy up front. Instead, give them something interesting and an audience will sit and listen to it, unless they’re a bunch of dilettantes and we’ve all played in those types of situations. SJ: The perils of playing on the road. Any closing comments or words of wisdom for aspiring musicians and/or Weissenborn players? EG: Geez, I’m kind of a hack at the Weissenborn, it’s not my main instrument. I do love playing them though. I would say with anything that you love, spend as much time as possible with it. You will find things about music and about life, about any kind of art that you would have never understood if you hadn’t put in that extra time. And I’m not talking about discipline, per se, as meaning doing something you don’t want to do or forcing yourself to practice. For me playing music has always been more of a devotion. I have no problems sitting here for 9-10 hours playing guitar, all day or all night. Sometimes I don’t want to play at all. Sometimes I might go a couple of days without playing. I have to touch the guitar everyday but I don’t have to play it. That’s really where it comes from. We’re often taught to develop our weaknesses, and sure you want to be able to get around a do a certain number of things. But, figure out what your strength is and develop that. That’s how you develop your own style.